R&D is not enough. Significant R&D spending might be necessary for some firms to develop new technologies but certainly do not guarantee their innovation success. 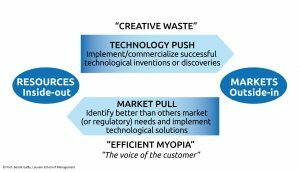 Identifying innovation opportunities requires finding new combinations of new or existing technologies with new or existing needs. The triggers of innovation opportunities which firms should proactively exploit include internal sources such as new knowledge, challenging routines and serendipity, and external sources such as changes in markets, industry and environmental constraints. Sizeable innovation opportunities do not pop up out of the blue. Organizations must invest time and resources to combine, integrate and mature innovation ideas into potential opportunities. They should also pursue already emerging opportunities and focus on scaling them up. (Book) Johnson, S. (2010) Where good ideas come from, Penguin Books. (Book) Nonaka, I., & Takeuchi, H. (1995). 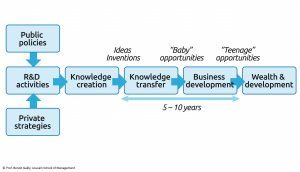 The knowledge-creating company: How Japanese companies create the dynamics of innovation. Oxford University Press. (Article) Baumann, J., & Kritikos, A. (2016). ‘The link between R&D, innovation and productivity: Are micro firms different?. Research Policy, 45, 1263-1274. (Article) Berchicci, L. (2013). Towards an open R&D system: Internal R&D investment, external knowledge acquisition and innovative performance. Research Policy, 42(1), 117-127. (Article) Brem, A., & Voigt, K. I. (2009). Integration of market pull and technology push in the corporate front end and innovation management—Insights from the German software industry. Technovation, 29(5), 351-367. (Article) Cassiman, B., & Veugelers, R. (2006). In search of complementarity in innovation strategy: Internal R&D and external knowledge acquisition. Management Science, 52(1), 68-82. (Article) Cattani, G., & Ferriani, S. (2008). A core/periphery perspective on individual creative performance: Social networks and cinematic achievements in the Hollywood film industry. Organization Science, 19(6), 824-844. (Article) Coyne, K. P., Clifford, P. G., & Dye, R. (2007). Breakthrough thinking from inside the box. Harvard Business Review, 85(12), 70-8. (Article) Di Stefano, G., Gambardella, A., & Verona, G. (2012). Technology push and demand pull perspectives in innovation studies: Current findings and future research directions. Research Policy, 41(8), 1283-1295. (Article) Dougherty, D. (1990). Understanding new markets for new products. Strategic Management Journal, 59-78. (Article) Elkins, T., & Keller, R. (2003) ‘Leadership in research and development organizations: a literature review and conceptual framework’. Leadership Quarterly, 14, 587-606. (Article) Foster, R. N. (2003). Corporate performance and technological change through investor’s eyes. Research-Technology Management, 46(6), 36-43. (Article) García-Manjón, J. V., & Romero-Merino, M. E. (2012). Research, development, and firm growth. Empirical evidence from European top R&D spending firms. Research Policy, 41(6), 1084-1092. (Article) Griffin, A., & Hauser, J. R. (1993). The voice of the customer. Marketing Science, 12(1), 1-27. (Article) Griliches, Z. (1979). Issues in assessing the contribution of research and development to productivity growth. The Bell Journal of Economics, 92-116. (Article) Hagedoorn, J., & Wang, N. (2012). Is there complementarity or substitutability between internal and external R&D strategies?. Research Policy, 41(6), 1072-1083. (Article) Hirsch‐Kreinsen, H. (2008). “Low‐Tech” Innovations. Industry and Innovation, 15(1), 19-43. (Article) Jensen, M.B., Johnson, B., Lorenz, E., & Lundvall, B.A. (2007). Forms of knowledge and modes of innovation. Research Policy, 36, 680-693. (Article) Leiponen, A. (2012). The benefits of R&D and breadth in innovation strategies: a comparison of Finnish service and manufacturing firms. Industrial and Corporate Change, 21(5), 1255-1281. (Article) Mowery, D., & Rosenberg, N. (1979). The influence of market demand upon innovation: a critical review of some recent empirical studies. Research Policy, 8(2), 102-153. (Article) Nelson, R. R. (1959). The simple economics of basic scientific research. Journal of Political Economy, 67(3), 297-306. (Article) Parrilli, M., & Heras, H. (2016). STI and DUI innovation modes: Scientific-technological and context-specific nuances. Research Policy, 45, 747-756. (Article) Salter, Ammon J., and Ben R. Martin. “The economic benefits of publicly funded basic research: a critical review.” Research Policy 30.3 (2001): 509-532. (Article) Santamaría, L., Nieto, M.J., & Barge-Gil, A. (2009). 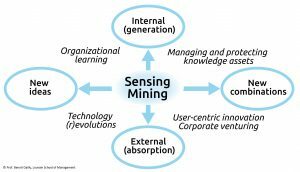 Beyond formal R&D: Taking advantage of other sources of innovation in low-and medium-technology industries. Research Policy, 38(3), 507-517. (Article) Spanjol, J., Qualls, W. J., & Rosa, J. A. (2011). How many and what kind? The role of strategic orientation in new product ideation. Journal of Product Innovation Management, 28(2), 236-250. (Article) Tipping, J., & Zeffren, E. (1995) ‘Assessing the value of your technology’, Research-Technology Management, 38, 22-40. (Article) Zhou, K. Z., Yim, C. K., & Tse, D. K. (2005). The effects of strategic orientations on technology-and market-based breakthrough innovations. Journal of Marketing, 69(2), 42-60. (Book) Lienhard, J. H. (2008). How invention begins: echoes of old voices in the rise of new machines. Oxford University Press. (Article) Dew, N., Sarasvathy, S. D., & Venkataraman, S. (2004). The economic implications of exaptation. Journal of Evolutionary Economics, 14(1), 69-84. (Article) Evangelista, R., & Vezzani, A. (2010). The economic impact of technological and organizational innovations. A firm-level analysis. Research Policy, 39, 1253-1263. (Article) Foss, N.J., Lyngsie, J., & Zahra, S.A. (2013). The role of external knowledge sources and organizational design in the process of opportunity exploitation. Strategic Management Journal, 34(12), 1453-1471. (Article) Gino, F. (2018). The Business Case for Curiosity. Harvard Business Review, Sep.-Oct.
(Article) Gnekpe, C., & Coeurderoy, R. (2017). The impact of internal and external technology sourcing on innovation performance: a review and research agenda. International Journal of Technology Management, 73(1-3), 21-38. (Article) Laursen, K. (2012). Keep searching and you’ll find: what do we know about variety creation through firms’ search activities for innovation?. Industrial and Corporate Change, 21(5), 1181-1220. (Article) Lounsbury, M., & Crumley, E. T. (2007). 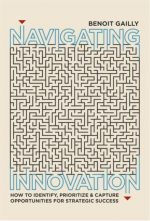 New practice creation: An institutional perspective on innovation. Organization Studies, 28(7), 993-1012. (Article) Santos-Vijande, M., & Alvarez-Gonzalez, L. (2007). ‘Innovativeness and organizational innovation in total quality oriented firms: The moderating role of market turbulence’. Technovation, 27, 514-532. (Article) Shane, S. (2000). Prior knowledge and the discovery of entrepreneurial opportunities. Organization Science, 11(4), 448-469. (Article) Acs, Z. J., Audretsch, D. B., & Feldman, M. P. (1992). Real effects of academic research: comment. The American Economic Review, 82(1), 363-367. (Article) Audretsch, D. B., & Keilbach, M. (2008). Resolving the knowledge paradox: Knowledge-spillover entrepreneurship and economic growth. Research Policy, 37(10), 1697-1705. (Article) Budish, E., Roin, B. N., & Williams, H. (2015). Do firms underinvest in long-term research? Evidence from cancer clinical trials. American Economic Review, 105(7), 2044-85. (Article) Chen, P.C., & Hung, S.W. (2016). An actor-network perspective on evaluating the R&D linking efficiency of innovation ecosystems. Technological Forecasting and Social Change, 112, 303-312. (Article) Criscuolo, P., Salter, A., & Ter Wal, A.L. (2013). Going underground: Bootlegging and individual innovative performance. Organization Science, 25(5), 1287-1305. (Article) Dosi, G. (1988). Sources, procedures, and microeconomic effects of innovation. Journal of Economic Literature, 1120-1171. (Article) Harmon, B., Ardishvili, A., Cardozo, R., Elder, T., Leuthold, J., Parshall, J., … & Smith, D. (1997). Mapping the university technology transfer process. Journal of Business Venturing, 12(6), 423-434. (Article) Jaffe, A. B. (1989). Real effects of academic research. The American Economic Review, 957-970. (Article) Kedia, B. L., & Bhagat, R. S. (1988). Cultural constraints on transfer of technology across nations: Implications for research in international and comparative management. Academy of Management Review, 13(4), 559-571. (Article) Landry, R., Amara, N., & Lamari, M. (2001). Climbing the ladder of research utilization: Evidence from social science research. Science Communication, 22(4), 396-422. (Article) Mansfield, E. (1991). Academic research and industrial innovation. Research Policy, 20(1), 1-12. (Article) Nambisan, S., & Sawhney, M. (2007). A buyer’s guide to the innovation bazaar. Harvard Business Review, 85(6), 109-118. (Article) Nemet, G.F. (2009). Demand-pull, technology-push, and government-led incentives for non-incremental technical change. Research Policy, 38(5), 700-709. (Article) Newbert, S. L. (2005). New firm formation: A dynamic capability perspective. Journal of Small Business Management, 43(1), 55-77. (Article) Qian, H., & Acs, Z. J. (2013). An absorptive capacity theory of knowledge spillover entrepreneurship. Small Business Economics, 40(2), 185-197. (Article) Teece, D. J. (1986). Profiting from technological innovation: Implications for integration, collaboration, licensing and public policy. Research Policy, 15(6), 285-305. (Article) Walsh, J. P., Lee, Y. N., & Jung, T. (2016). Win, lose or draw? The fate of patented inventions. Research Policy, 45(7), 1362-1373. (Article) Welsh, R., Glenna, L., Lacy, W., & Biscotti, D. (2008). Close enough but not too far: Assessing the effects of university–industry research relationships and the rise of academic capitalism. Research Policy, 37(10), 1854-1864. (Article) Zahra, S. A., Van de Velde, E., & Larraneta, B. (2007). Knowledge conversion capability and the performance of corporate and university spin-offs. Industrial and Corporate Change, 16(4), 569-608.